Much has been said about the need to augment the skills and increase the productivity of small factory workers by using robotic assistants called co-robots. Europe funded an SME (Small and Medium-sized Enterprise) public-private consortium to determine the needs and develop robotic solutions for those needs. In America, venture and privately-funded Rethink Robotics whose founder and CTO is ex-MIT Professor and co-founder of iRobot Rodney Brooks has been doing the same thing: developing an adaptive manufacturing robot that can work safely alongside human workers. Brooks is devoted to - and an eloquent spokesman for - his mission of creating smarter, more adaptable, low-cost robotic solutions that can help manufacturers improve efficiency, increase productivity and reduce their need for offshoring. 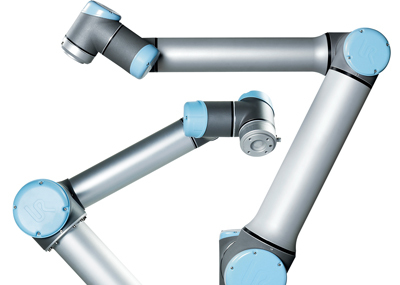 Almost all of the big industrial robot makers have or are working on lightweight and human-friendly arms, but are not offering them at low cost, or with user-friendly training, or the plug and play features. In addition to them, there are other robot startups in the SME marketplace - and on the horizon - but none are as far along in their development and low cost as these two at-present privately-held companies: Rethink Robotics and Universal Robots. 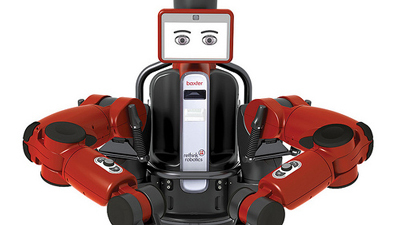 Rethink Robotics' new Baxter robot is getting a software upgrade. Big deal? Actually, it is. 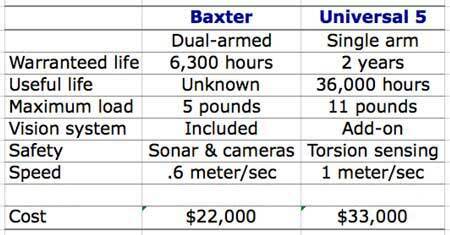 When Rethink Robotics launched Baxter late in 2012, it was obvious that Baxter needed some improvements. Rodney Brooks promised those improvements incrementally over the next few months and year. Brooks' vision was to have a hardware platform frequently enhanced with new software and capabilities - and it is happening as promised and on schedule. Rethink recently launched an academic version of Baxter with a Software Development Kit (SDK) enabling users to train the robot and share their programs with other Baxter owners. Although the SDK academic version is different than the production model, after a while, the concept of an open SDK and an Apple-like app store will be enabled across Rethink's whole product line. Just the other day Rethink upgraded their operating system to V1.1 to make it easier to integrate existing factory machine synchronization, I/O and task sequencing and ordering systems into Baxter's repertoire of programs - a very neat and necessary feature. Now Baxter can integrate and connect with up to 9 digital ports to existing automation systems through signaling. This new update also enables users to coordinate actions across Baxter's two arms. One of those new distributors, Scott Hendrickson, CEO of Olympus Controls, said: "The quality of new leads has been off the charts. Most of our existing clients are Fortune 500 companies, but now we’re able to better service small business owners on Main Street as well,” he says, attributing the growth to the cost and ease of use of the UR robot. “In typical robot solutions, you multiply the robot cost by three or more to get the end price due to safety guarding and expensive programming. None of this is necessary with the new Universal Robots.” Hendrickson went on to say: "We believe these new robots will soon cross the chasm between early adopters and mainstream users." UR is building 100+ robots a month of which approximately 25-30% are for customers in the U.S. for 2013. 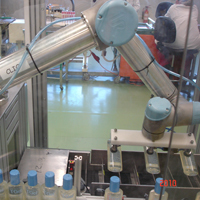 Universal Robot picking and placing multi-sized cream containers in Johnson & Johnson factory in Greece. The robot takes bottles of cream from one production line, and places them onto the packaging line. Flexibility is the key requirement because there are several different types of creams coming down the line, each positioned differently. Baxter picking and boxing plastic parts at Rodon Group factory in Pennsylvania. The robot is being "trained" by the very people it is assisting. Because Baxter is oblivious to heat or noise, it can take on those “hard to fill” positions in noisy and un-airconditioned industrial circumstances.